What is power point in MS office? 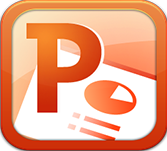 Microsoft PowerPoint is a commercial presentation application of Microsoft for Microsoft Windows and Mac OS X. Current versions of PowerPoint at the time of writing this tutorial is 2010 for Microsoft Windows and 2011 for Mac OS X. It is a presentation tool which supports text, shapes, graphics, pictures and multimedia along with integration with other Microsoft Office products like Excel. By default, documents saved in PowerPoint 2010 will be saved with the .pptx extension and the file extension of the prior PowerPoint versions will be .ppt. This tutorial is mainly designed for users who wish to learn Microsoft PowerPoint in simple steps without having much knowledge on computer usage and Microsoft applications. This tutorial will give good understanding on MS PowerPoint from where you can take yourself at higher level of expertise. Before starting with PowerPoint, users should have a basic knowledge of Computer peripherals like mouse, keyboard, monitor, screen, etc. and their basic operations. Find & Replace Content In Powerpoint 2010?